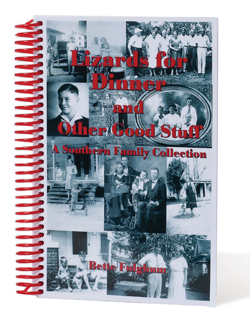 Bette Fulghum preserved this family chicken salad recipe in her cookbook Lizards for Dinner and Other Good Stuff. Cook chicken. Cool and dice the meat. Add the celery and pickle cubes. Mix the boiled dressing into the chicken mixture while dressing is warm. You may have to use several tablespoons of mayonnaise to make this wet enough. If you prefer not to use mayonnaise, make two recipes of Granny’s Boiled Dressing. Serve chicken salad cold. Combine all ingredients in a double boiler. You do not have to use a double boiler, but if you use a pot on the stove, be sure to stir often to keep it from sticking. Stir frequently until well blended and thick.